Usually less than 3/4 of an inch in length and have four wings. I am usually golden brown in color with black stripes on my abdomen. I have a stinger at the end of my abdomen. I drink nectar from flowers or juices from fruit. 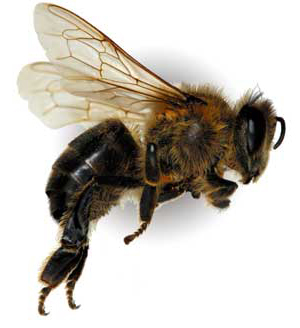 I am a social insect and live in large colonies, usually in hives, up to 80,000 individuals. I am found worldwide. I go through four stages of development: egg, larva, pupa and adult. The queen bee lays eggs and the worker bees will take care of my egg until I hatch. I will stay with the hive usually for the rest of my life.